From now on, you're Chewbacca. Do you think I'm cute, Private Chewie? Director Gavin Hood’s adaptation of Ender’s Game, controversial North Carolina-based author Orson Scott Card’s decorated 1985 sci-fi novel, smacks of Starship Troopers sans the social and political satire or kitschy charm, crossed with Harry Potter (yes, I understand Card published his novel 12 years before J.K. Rowling’s first book; the comparison remains illustrative). Fifty years after mankind was nearly annihilated by an alien insect race called the Formics, brilliant preteen Ender Wiggin (Asa Butterfield) is plucked from his family life by military commander Colonel Graff (Harrison Ford) to join the International Fleet and attend Battle School. 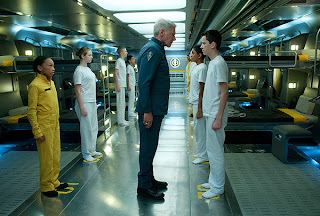 Anointed by Graff as “the One,” Ender and his fellow cadets train to essentially become virtual-reality gamer soldiers tapped to wage interstellar war against the Formics. Hood’s visuals are impressive enough, and the cast—which also includes Hailee Steinfeld, Abigail Breslin, Viola Davis and Ben Kingsley—is solid and invested in the material. However, Hood’s screenplay eschews much in the way of intellectual shadings until a provocative penultimate act that introduces some compelling moral and psychological conundrums. Unfortunately, they are quickly cast aside for a finale that scales down the novel’s climax for a tacked-on, cloying coda.